Hi, again! I’ve popped back in to direct you to a bit of fashion history reading over at The Handmaker’s Factory blog. I’ve contributed my first article (of many, hopefully) and I’d love to know what you think! FYI: Thanks for the sick baby well wishes. The kid (the boy twin, he of the always-gets-sick-first-weak-immune-system) did stay home again, today. Mostly sleeping. And taking advantage of more TV viewing than usual. He should be good to go for tomorrow, hopefully. Congrats on the article! It was a very good read. 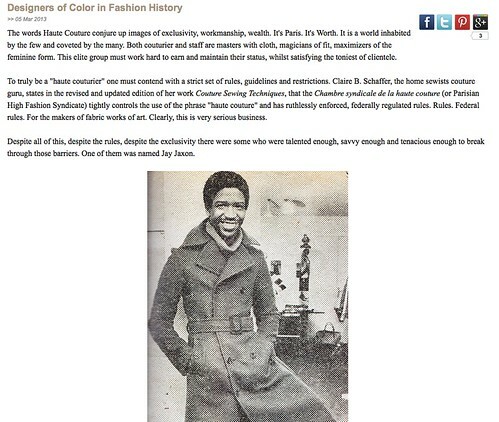 Although it upset me that I’ve never heard of him before, not even in the fashion history class I took in college. But I suppose that’s not surprising. It reminds me of the often absent history of minorities in architecture. I would love to learn more about him. Great article! Where can I found out more about him? Congratulations! I LOVE your post! Beat back a lot of stereotypes all at once. Learned a lot of new information. Great article (congrats)!!!!!! I wonder what Jay’s parents thought when he dropped out of law school to enter the fashion world! Great, great article – congratulations again. It’s really disturbing that Mr. Jaxon has been left out of fashion history — but I’m glad you were able to bring at least our attention to him! I love the idea of this young guy coming to Paris and shattering the ideas of what a couturier looked like. And I love the photo of him — that jacket is absolutely impeccable!